Emailing yourself is one of the simplest tech hacks. When you need to get a file from one device to another or save something important, you can email it to yourself. Next time you check your email, it’ll be right there along with the rest of your messages. You can email your apps, too. Evernote lets you turn emails into notes. 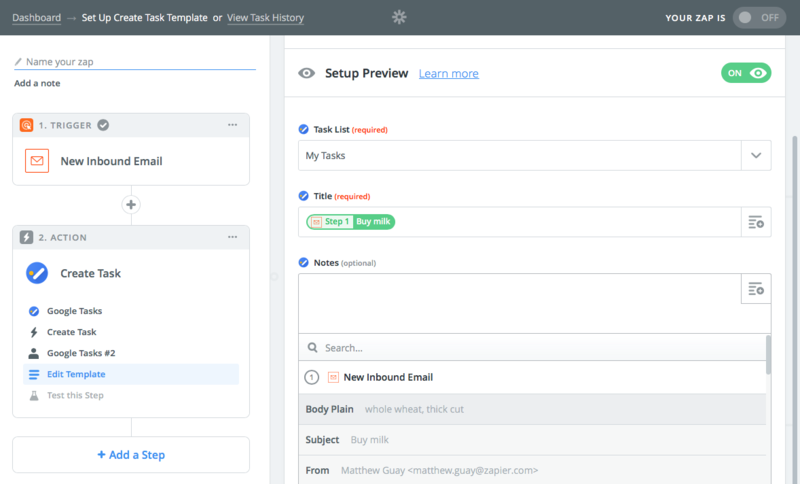 I Done This, Things, OmniFocus, and many other to-do lists let you add tasks via email. Kindle lets you email books to your eBook library. Tumblr lets you email new blog posts. And Zapier lets you add email data to any app—and make custom email-powered notifications. Want to email data to your apps? Start out by making a Zap—or an automated workflow in Zapier. Choose the Email by Zapier app. Zapier will then let you create a custom email address for your workflow. Now add an action app to Zapier—the app you want to use with your emails. Tap the + button beside the detail fields to insert data from your email to the app. You could make the subject of your email the task name, say, and the body of the email the description. Or you could include more details with named variables to include contact details, appointment info, and other things you want to add to your apps via email and have Zapier fill them in automatically. Or perhaps you’d like Zapier to email you whenever something happens. 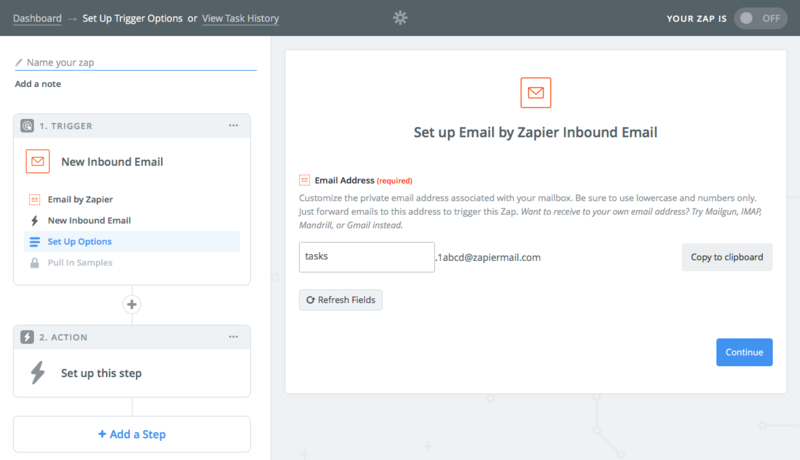 Email by Zapier can send those custom notifications for you, too. It works much the same way. Start by selecting the app you want to send you email notifications. Your eCommerce store, team chat app, invoice tool, to-do list. Anything where you want to get emails whenever something happens. Or, you can even use it to send emails to others—perhaps a welcome message to new email list subscribers or customers, or reminder emails to your team when they need to attend a meeting or complete a task before a deadline. Add the app you want Zapier to watch for things you need to send emails. Then you’ll likely want to add a Zapier Filter to watch for the info you want. Only need a notification for events other than your weekly stand-up meeting, or when someone orders a specific item from your store? Add a filter to have Zapier watch for the particular thing you want. Or you can use Zapier Schedule to send emails every day or week at the time you wish, or Zapier Delay to send emails a specific time after something happens (great to remind you to ship a new order tomorrow, or to re-tweet your blog post a week after you published it). 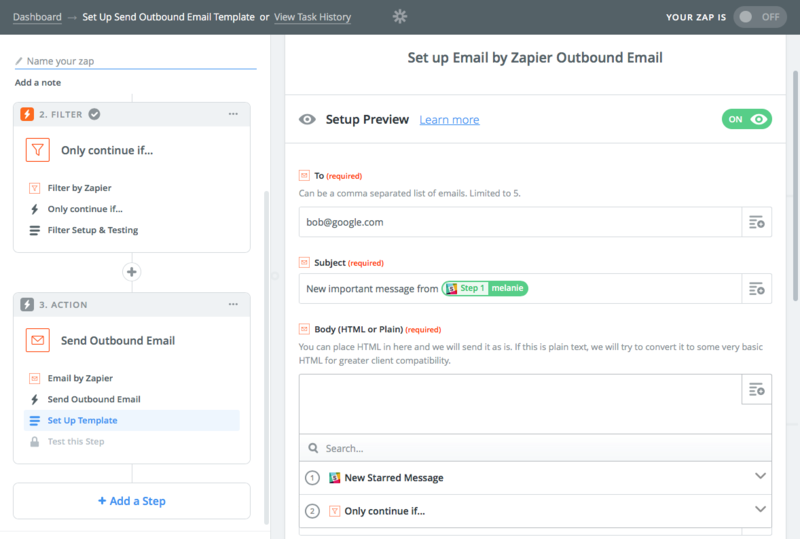 Add an Email by Zapier action as your final step to get the email. Enter your email—or the email of the person you want to receive the notification—in the To field, then customize the email subject and body with your text or the fields from previous steps via the + button on the right. You can include attachments, a custom From name and reply email address, and add others with CC and BCC fields. Turn on your Zap, and whenever something new happens, or it’s the time in your schedule for a weekly notification, Zapier will send that email like clockwork. It’s a great way to get customized email notifications. You can even pull it all together. If your apps send you too many email notifications, use a custom Zapier email address in those apps to have all of their emails forwarded to Email by Zapier. Add a filter to weed out the emails you don’t want to receive. Then add an Email by Zapier action to send the filtered notification emails you need to read on to your inbox. It’s a personal inbox secretary bot.